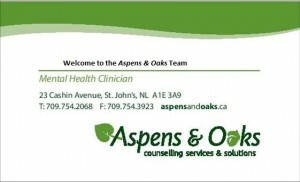 Welcome to Aspens & Oaks Counselling Services (A&O). 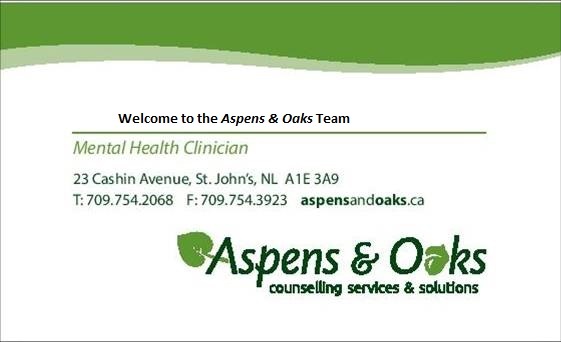 Did you notice that the Aspens & Oaks logo is at the bottom of the card and underneath the Clinician Name at the top of our Business Card? Our business card format is not set up like this by accident! Actually that format is symbolic of our business model where we see our role as providing you with all the supports you need so that you can do what you do best! Over the last 21 years Aspens & Oaks (A&O) could not have grown and provided service on the scale that it has without the dedication, talent & expertise of our clinicians & staff. We encourage you to access more information via our Careers section.